YOU MAY HAVE seen Vittorio de Sica's 1970 epic The Garden Of The Finzi-Continis, a dreamlike film about a family of Italian Jews who saw their world collapse in 1938 with a concentration camp as their next destination. The following story is about the Mosseris, a comparable Egyptian-Jewish-Italian family living in Cairo's Garden City during the interwar period. Although their world also changed in the 1950s, unlike the Finzi-Continis, they ended up living in courtly splendour in Western Europe. Caught in the middle of mounting urban redevelopment is Villa Mosseri at No.24 Ismail Pasha Street, a 1.5 acre urban oasis separated from the outside world by an iron fence. Welcome to Switzerland, Garden City's last surviving patch of green. For several decades Villa Mosseri has been the property of the Swiss Confederacy which acquired it from its last owner the late Denise Mosseri who died in Paris 1992. But before becoming foreign property the stately mansion had been the Cairo residence of Denise's father the renowned banker-developer Elie Nessim Mosseri Bey. This remarkable gentleman along with his eleven sibings belonged to the affluent branch of the large Mosseri clan. The Mosseri ancestral home was at the corner of downtown Cairo's Fouad Avenue (now, 26th of July) and Mohammed Farid Street. When the Mosseris moved out their townhouse became home to Cairo's first Museum of Modern Art. As one by one, the children of Nessim Mosseri Bey came into their own they spread out into Cairo's new suburbs. Elie Mosseri's eldest brother Joseph Mosseri built himself an impressive red brick mansion in Giza surrounded by a large garden overlooking the Nile. 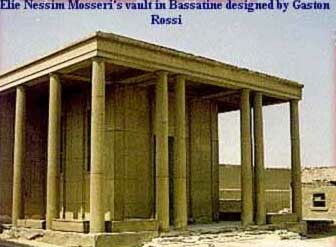 For a long time the sreet adjacent to his house was called Youssef Mosseri Street. Today his house is home to the Russian Embassy. 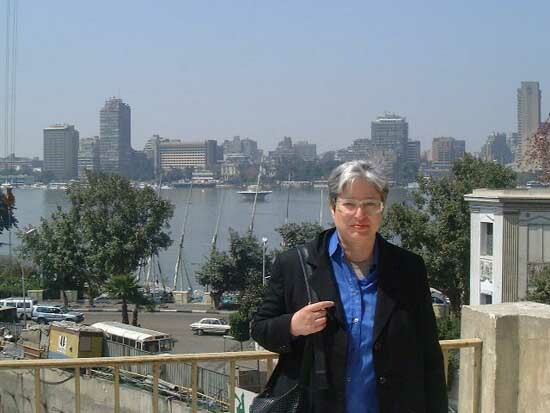 Elie Mosseri's eldest sister Vicky, (Mrs. Aaron Alexander) lived in Villa Goodman on al-Kamel Mohammed Sreet, Zamalek. The villa was replaced in the late 1940s by the two identical Wadie Saad apartment buildings. Another of Elie's sisters, Regina Mosseri, lived with her husband Gustave de Cattaui in a large wedding cake shaped villa No.15 Mohammed Mazhar, Zamalek. Today it is the Greater Cairo Library. Elie's brother Maurice owned a large house with a view on Zamalek’s Fish Garden, the Gezira Sporting Club and the Nile's small branch. In its place stands the soylent green aluminum and glass German Embassy. Another brother, Jacques, built a house overlooking the Nile in Giza. Today it is the Saudi Embassy on Giza (Charles de Gaulle) Street. Elie Mosseri's Garden City mansion was among the best and largest in its class. Standing at the west end of a large park hidden behind tall trees it overlooked two other proud homes belonging to Egypt's rich and famous. Between them, the three inter-visible mansions were home to the secular leaders of Egypt's three faiths. 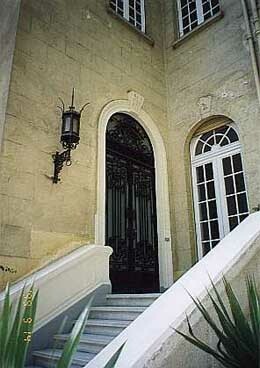 The largest of the three mansions belonged to former Prime Minister Adly Yegen Pasha. It would later pass on to his only daughter who married Cherif Sabry Pasha, King Farouks' maternal uncle. The second mansion belonged to Murad Youssef Wahba Pasha, a leading Coptic notable and pre-WW-II minister of agriculture, trade and industry. Wahba’s heirs would later sell the property to Prince Sultan of Saudi Arabia just about the time when the Cherif Sabry Pasha palace was destroyed to make way for a five-star hotel--originally the Nova Park, now the Fours Seasons. The third mansion belonged to Elie Mosseri Bey, vice president of the Jewish Community Council of Cairo. Mosseri died on 10 June 1940 coinciding with Benito Mussolini's historic announcement from his Venice balcony: Italy had joined the war on the side of Germany. 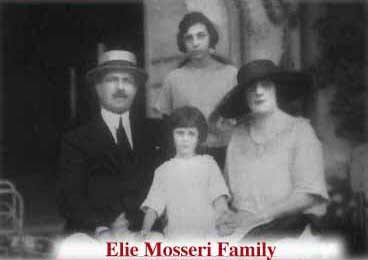 Although Elie Mosseri claimed Italian citizenship, unlike most Italians in Egypt, the Mosseri clan had never subscribed to El-Duce's extreme brand of fascism. And besides, those who toyed with the idea quickly changed their minds when its anti-Semitic overtones became public. Following Mosseri's death his Garden City mansion became the temporary home of his third wife Helene Polymires an Alexandrine Greek. Aside from a sister married to British celebrity author G. Sitwell, the Polymires siblings had married into Egypt's moneyed oligarchy, notably Rodocanachi, Salvago and Mosseri. The last Madame Mosseri or 'la belle Helene' as she is often described in several King Farouk biographies, was the confidant of Egypt's young monarch. According to William Stadiem author of Too Rich, Helene was King Farouk's go between with other court favorites. It was for this reason that H.M. ordered the installation of a special hotline red telephone linking him with his accommodating accomplice. The first of Helen's predecessor was Laure Felix Suares. Through her Cattaui mother, she was also Elie Mosseri's first cousin. 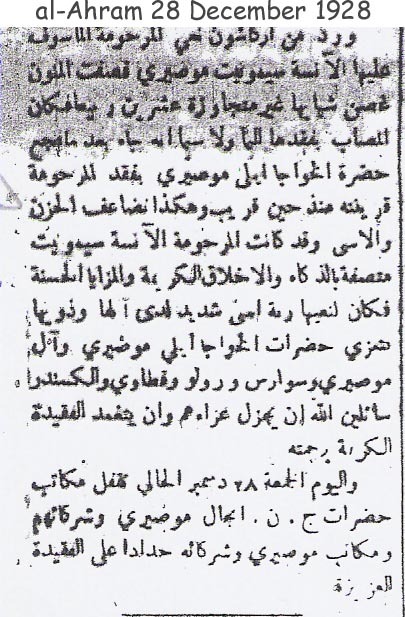 Their publicized wedding was described as the seaon's social event by contemporary newspapers, attended by Egypt's Who's Who including composer Saint-Saens. The religious ceremony officiated by Egypt's Grand Rabbi took place in Cairo's main synagogue that the Mosseris had help build. The gala reception meanwhile took place at the large Suares mansion on Kasr al-Dubara Square, Cairo's most elegant district at the time where Laure's relatives and friends owned most of the grand townhouses. Elie Mosseri's only children--Denise and Simonette--were from his first wife. They were raised at No. 24 Ismail Pasha Street. Simonette passed away a few months after her mother's own premature death in 1928. Elie's second marriage was to Georgette Hirsch the widow of famous French banker and department store owner Alphonse Kahn. 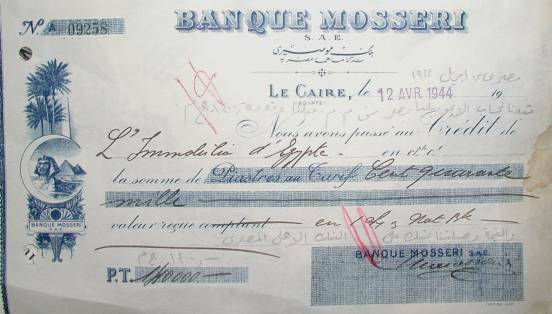 Not that he needed any additional assets--Mosseri already owned chunks of Egypt's private sector--his new wife's dowry included shares in Galleries Lafayette. Like Laure Suares, Georgette also died in France. But unlike the former who was buried in the imposing Suares mausoleum (designed by Antonio Lasciac, no less) in Alexandria, the second Madame Mosseri was laid to rest in Paris. A short time would pass before Elie remarried this time to a Greek. Contemporary wags were quick to quip the new Mrs. Mosseri was big on looks but short on cash. Elie Mosseri's only surviving daughter, Denise, was stranded in the United States when her father died. It was while getting her degree in maths that she met and subsequently married Richard Dreyfus a scion of the Basle banking family of Dreyfus Sohne & Cie. AG, Switzerland. After the war, Denise, Richard and their newborn daughter Catherine Charlotte-Simonette returned to Cairo. Despite the responsibility of raising a family which now included a son (Pierre b. 1949) and attending to Cairo's whirling post-war mondanitées, Denise Mosseri made time to redecorate the famed Mena House which featured among her father's vast inheritance. Among other things Elie Mosseri had been an important shareholder in the Egyptian Hotels Co. which owned several of the region's first class properties. With Rothschild backing, Mosseri had built in 1931 Jerusalem's King David Hotel. Between its 22 July 1946 bombing by the Irgun Jewish terrorist gang and long before it was purchased by the Federmann family in 1957, Denise Mosseri redecorated it in opulent pseudo Egypto-Phoenician style. It could have been the return of her stepdaughter that pushed la belle Helene to make separate living arrangements in the Garden City villa. This would account for an additional floor which would also be Helene's undoing when, imbued with liquor and tranquilizers (the King had been ousted from his throne), she fell from her terrace plunging to her death. Ironically, none of Elie Mosseri's three wives were buried in his majestic family vault in Bassatine for even in her death la greque had remained an outsider. Two years before the king was toppled a divorced Denise Mosseri left Egypt relocating at her opulent Parisian quarters at No. 21-22 Place Vendome. In 1953 Egypt turned into a republic with the promise of major social and economic reforms. Instead, the country received a massive overdose of socialism. As a result of these economic changes, most of Garden City's original residents--especially those with foreign sounding names--moved out or were forced to. Empty homes were for the picking and foreign embassies had an unprecedented choice of mansions: lease or purchase. There were those splendid mansions facing the Nile or the ones with the big gardens or, better still, the ones close to the British Embassy. The American government that had finalized on 25 March 1947 the purchase of their very first piece of property in Egypt--the Villa Chedid, could now close in on the surrounding villas two of which had once belonged to Elie Mosseri's relatives. It was during her marriage to polo player Max Victor Harari and with the knowledge she would never return to Egypt that Denise leased her villa in Garden City to the United Sates ambassador as a temporary residence. Later, she would conclude another astute deal selling her house to the Swiss Confederacy with the intent they keep it as an ambassadorial residence. In return the Swiss embassy in Cairo agreed to ship Denise Mosseri's collection of china, boules and other valuable objets d’arts. True to their agreement with Denise Mosseri the Swiss government would preserve the house, its annex and garden, down to the last royal palm and rose bush, but minus the swimming pool, making it the last shred of evidence that Garden City once had gardens. At the writing of this article Elie Mosseri's descendants continue to live in splendor at Place Vendome, Paris and in Basel, Zurich. I was so happy to read that 24 Gamaleldin Abul-Mahassin has become a historic landmark! I lived in that hourse from 1982 to 1986, my father was the number 2 at the Swiss Embassy at that time, and I remember his constant battle with "Berne" who wanted to tear the building down and build a more modern Embassy. I am sure glad he persevered and managed to change their minds! I was between the ages of 13 and 17 when I lived in that villa and have very fond memories of it. So glad the villa is now forever protected, good article! Je m'appelle Gerard MUSSERI et habite Marseille, mon père se nomme Clément et mon Grand-père Léon que je n'ai jamais connu est né au Caire. C'est lors d'une recherche sur Internet que j'ai vu le nom de MOSSERI et je n'ai pu m'empêcher de faire le rapprochement. N'ayant jamais pu avoir le moindre renseignement sur mes ancêtres, je souhaiterai si possible connaître s'il existe un quelconque lien de parenté. Je vous remercie de bien vouloir me répondre.